Thinking Through Geography is a resource for geography teachers at secondary level to create exciting and memorable geography lessons built on geography thinking skills. Teaching geography using thinking skills activities will develop transferable learning skills through interaction and independent learning. You can now purchase the entire Thinking Through Series for the reduced price of only £149 - normally £318! Find out more about The Thinking Through Series. enthuse students to think beyond their exams and establish a mastery of the subject. Devised by 10 classroom teachers active in the Thinking Through Geography Group, this photocopiable resource helps teachers create exciting and memorable geography lessons. It is about children’s learning and the way you can assist their learning in geography. This resource is as much about professional development for the practising teacher as it is about high standards of geography provision. Geography is a brilliant, exciting subject. However, our main concern is not with geography, it is with children’s learning and that is the difference. 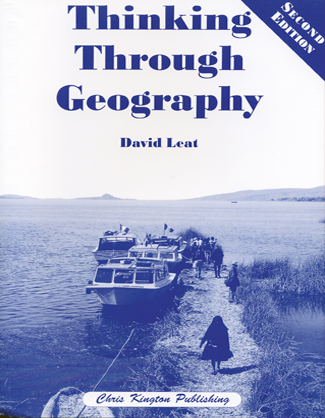 Geography should assist learning, not just be a load of content to be delivered, and it is this fresh approach that has attracted so much acclaim. Strategy 6: Fact or Opinion?